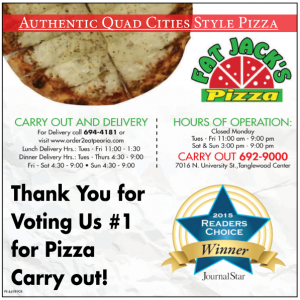 Voted number 1 carry out in Peoria Pizza! These limited hours will remain in effect until further notice, but are temporary. Awesome pizza! I can't say enough about the quality of the food here! Mark and Jean are wonderful - super friendly, customer oriented....I really cannot say enough!!! I've been many places in my life as a sailor in the US Navy (Rome, Sardinia etc.) and every place has its own special flavor. Fat Jacks and Mark the owner have the best quality ingredients for just about any type of pizza you could want. Pizza though is not just about flavor, it's about texture and eye appeal also and Fat Jacks has the market cornered. You as the customer need to let him know how you want your pizza as he will cook it to his best ability to make it just how you like it. You know what I mean, really crisp bottom and slightly over cooked cheese on top or soft and spongy crust and stringy gooey cheese on top. They even have anchovy for us lovers. They beat Firehouse hands down. Good pizza. Chewier than expected as far as the crust is concerned. Plenty of cheese and toppings. Added a star because the owner(?) that's always in there is an awesome guy and the service is great. My family grew up on Franks Pizza out of Silvis, Illinois. Not only is Fat Jacks's as good but their service was awesome. Now we don't have to drive 1 1/2 hours to get our favorite pizza. We will be back.